Following on from the Sunday night blues that I am sure we all experience, comes the Monday morning reds. Monday morning reds can occur as either; hungover, bloodshot eyes; hours of NTSC Dreamcast fun [red swirl]; or, in my case, the Royal Mail delivery man. Over at SEGA Nerds, they have been posting about the new House of The Dead game, out on Wii I think. I don't have a Wii, so I don't care about that to be honest. What I did care about though, was my recent purchase - a UK DC gun. It came with HoTD2 (already have it in PAL and Jap) but it brought my gun tally up to two. Another welcome addition to the residence was a FREE hand-me-down 42" Plasma monitor . Amazing. This is going to rock. Can't wait. Thank you Mr. Postman. Lots of guns have been bought in the past few days on the junkyard. Do you guys wanna talk? Its going to be okay, we all wish we could go to Dubai but its just not gonna happen. Let them have their theme park and put the light gun down. Barry, I love your sonic picture. I'm still using a 24 inch (guess) CRT. Does the lightgun work with a plasma screen? The only downside of playing my DC in crystal clear VGA mode on my LCD HDTV is that the lightgun is incompatible with it. I'll have to check if it is compatible - websites seem to disagree on the matter for plasma screens. Even if it's not, I can play on my 28" CRT no problem. I think I've joined the gun club, I'm gunning for (no pun intended) a lightgun on ebay at the moment. Sweet...I just upgraded from a 27 crt to a 65!!!!! inch LED DLP and yeah.....I'm in heaven. I'm still running the dreamcast on the Kiosk I have that is 13inches. Its too old school to change...although people more and more when they see the kiosk say "whats dreamcast?" :( its only been ten years people. Keep in it the kiosk Benjamin, and keep educating people. Barry, you've just been given two tickets to the gun show, my friend. Any chance of an article on Death Crimson 2? From what I've read, its a so-so lightgun game that has the awesome ability for one to record custom voices for in-game damage. example: player 1 gets shot and yells "That smarts!" in your own voice. I did not know about the recording aspect of it though...I will have to try that out. I have played through it and it has a ton of cutscenes. Caleb, check out gamefaqs, I read a pretty helpful faq of what the Japanese menus read in english and how much space you need to record your voice. マーティン, totally can't wait! PS-what does マーティン read as in English? No! Leave it. Makes you unique among the others. Though if I may suggest "マーティン, I'm the man." good-o, because I can't be arsed figuring out how to change it anyway! 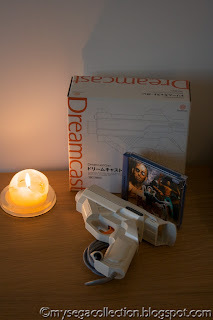 Just received my Japanese DC light gun and HOTD2, plus scored a starfire light gun and the US version of Confidential Mission on ebay. Totaled out to $55 for 2 games and 2 guns. And yes, I'm aware that the JP gun won't work on Confidential Mission. @ Barry - knowing that you have been inspired, only inspires us at the 'yard to work hard at delivering top quality articles with true life experiences on a regular basis.